While mobile devices have long outsold desktop PCs, for most of us, serious work still means a separate monitor, keyboard and mouse. 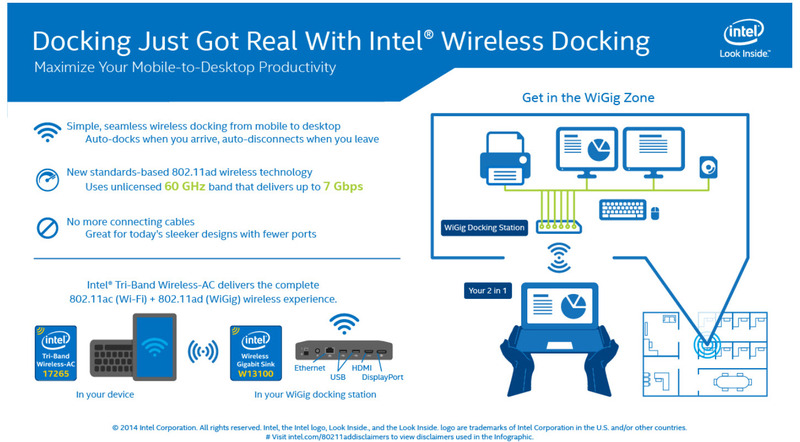 But connecting and disconnecting a plethora of cables and dongles every time you move your notebook from A to B can be irritating, so Intel has been working on a solution that utilizes wireless gigabit (WiGig), which provides enough throughput to dock even full HD monitors. Wireless gigabit (802.11ad) supports speeds up to 7 GB/s and operates at 60GHz, compared to Intel Wireless Display (WiDi), which is limited to 600 MB/s. WiGig is designed to operate with low power and high speeds at very short distances, 10 meters maximum, so is ideally suited to connecting devices that require large amounts of bandwidth at short range. Because of its limited reach, in practice around 1.2 meters, and inability to penetrate walls, WiGig isn’t going to replace your home WIFI network at the moment. Besides the fast speeds, WiGig also benefits from being able to cope with dense office environments, where the sheer quantity of wireless devices might impact performance, and has built-in video codecs. WiGig security uses existing standards based on IEEE802.11 for encryption and authentication. Although not present in the current generation of devices, support for Intel Wireless Display and Rezence wireless power charging is planned for the future. So what do you need for wireless docking? First of all a mobile device that supports WiGig and the Wireless Bus Extension (WBE) protocol, and a wireless dock, which Dell and Hewlett-Packard have already released to market. Both devices support dual displays via HDMI or DisplayPort, each up to 1080 pixels at 60 frames per second. But there’s still plenty of bandwidth left to support other peripheral devices, such as keyboards, mice, web cameras, printers, USB 3.0 portable disks, Ethernet, and audio equipment. Notebooks with WiGig aren’t that common right now, and tend to be limited to high-end models, but as WiGig becomes more prevalent, reliable wireless docking, and other applications, such as the ability to stream 4K video from point-to-point, will become more common in consumer-grade hardware.